It displays all the reviews of WooCommerce products in a single page/post with filter, enabling the readers to read all the reviews in a single page. You can now view all the reviews of your WooCommerce store in a single page with WooCommerce Show All Reviews. Single page review display will allow the readers to have a quick look through the reviews to have a better idea on the products. You can select the pages for which you want to display all the reviews without pagination. Display all the reviews in a single page. Display page wise reviews if pagination format is selected in settings. Related short codes are present for displaying reviews on selected page. Exclude unwanted reviews of a particular product. Template options for enhancing look and feel. Read More button to display long reviews. Pagination – Set pagination from Front End. Read More – It will appear if the review is too long. Clicking on ‘Read More’ link will display the whole review. 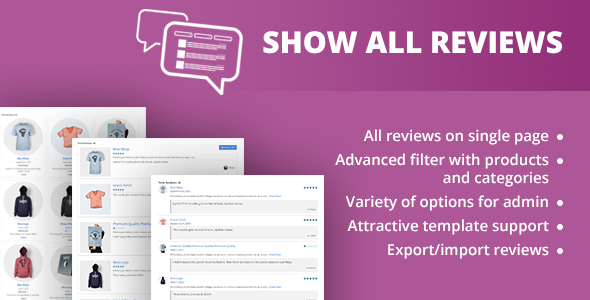 Reviews Filter – Choose a Filter Criteria from the Pull Down Menu. Products – All Products List will be shown, click on a product to view all reviews of that Product. Product Categories – Product Categories will be listed, click on a category to view review of all products belonging to that category. Product Newness – Products will be sorted on the basis of its newness. “New to Old” will display reviews of the new products on the top and vice versa for “Old to New”. Product Price – Products will be sorted on the basis of its Price. “High to Low” will display reviews of the products with high price on the top and vice versa for “Low to High”. Product Rating – Products can be sorted on the basis of its rated. “High to Low” will display reviews of the products with high rating on the top and vice versa for “Low to High”.